The emerging Castlefield Design District of Toronto has a new kid on the block – the recently opened GE Monogram Design Centre and cooking studio. Designed by Harry Pontarini Architects, it aims to “elevate Toronto’s Design District and culinary landscape”, according to Monogram General Manager, Philippe Meyersohn. On Thursday, March 26, we had the chance to check out this beautiful new space during their launch party. The new design centre consists of two floors. The main floor houses the spacious 4,000 sq ft. showroom, where GE Monogram’s professional kitchen appliances were on display. There are two kitchens – the Forest Hill Kitchen with its contemporary design, and flush appliances, and the Brooklyn kitchen, taking more traditional cues and blending classic and contemporary styles. The whole showroom is absolutely gorgeous, and will surely inspire you with ideas for your own kitchen. Top Chef Canada Winner Carl Heinrich and his team provided the gourmet bites for the evening, using the space and the appliances to their fullest. Also providing eats from the evening were Hooked (with Chef Kristin Donovan also present) and the Cheese Boutique. Guests enjoyed fresh west coast oysters, charcuterie boards, and cheeses among other things. For sweets there were cinnamon buns, and even gourmet ice cream in flavours such as saffron, cherry cola, and popcorn. Perrier Jouët champagne, and cocktails made using Absolut Elyx, were also being served. Heading to the second floor, you ascend a circular staircase with an impressive glass light sculpture overhanging. You then enter the equally impressive 2,500 square foot cooking studio. Again it’s a fully functional space with the GE Monogram appliances proudly showcased. The cooking studio is helmed by Donna Dooher, owner of Mildred’s Temple Kitchen, and Esther Benaim formerly heading Great Cooks on Eight, also a cooking school. This space can be used for social functions and events, lessons, and demonstrations, where guests can partake in the cooking, or simply watch as the chefs prepare great dishes. There is also a private dining room where the guests can enjoy the kitchen creations. Another unique feature is the soon to be completed urban herb garden, developed in consultation with the Toronto Botanical Gardens. 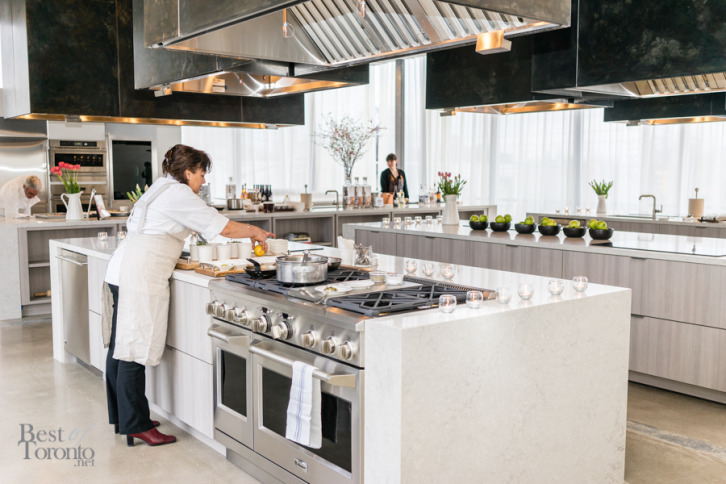 The new GE Monogram Design Centre and cooking studio is located at 1290 Castlefield Ave., just west of Ronald Ave. Its hours are 10 AM to 6 PM, Monday to Friday and 11AM to 3 PM on Saturdays.